There are millions of people out there that are vision-impaired or having difficulty in reading printed material. And generally they have to rely on some text-to-voice conversion devices in order to continue gaining knowledge through these material sources. Just recently, Intel Inc has announced an Atom based portable device that can scan printed materials and convert them into digital text that eventually can be read out so that those misfortune groups will able to enjoy the reading materials without any barrier. 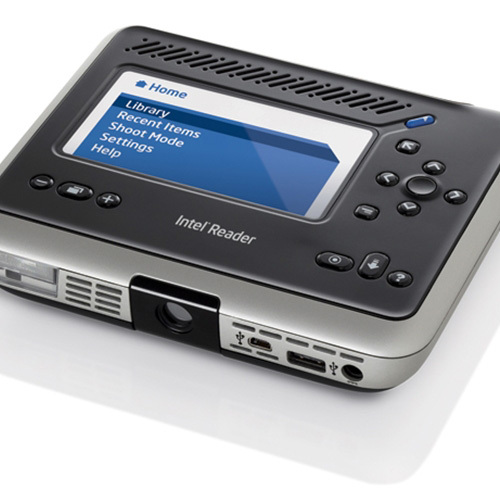 Named as Intel Reader, it is featured with a 5 megapixel camera that can be used to capture any printed text and convert it into digital text. Those converted text can be displayed directly on its tiny screen or stored into its built-in 4GB SSD (Solid State Drive). With the assistance of thermally efficient Intel Atom processor, these pure texts can be translated into speech so that users can enjoy the reading without the need to look into the screen at all. That is not all, it can be paired with Portable Capture Station to accelerate the conversion especially when you are scanning a whole book with pages of printed materials. The Intel Reader is already available now but due to its limited quantity targeted for niche market, its retail price of $1500 (excluding the Portable Capture Station at $400) is at a high side which is a few times higher than conventional Atom based solution. Nevertheless, this is a good move to demonstrate its processor capability and be able to penetrate into new market segment and we should expect the price to be dropped further once the production volume ramps with increase demand from end users.